Literacy is one of the most important skills that needs to be fostered in the early years. One of the best ways to start is to is to inspire a love of books by reading to children when they are still just a baby. As time moves on phonemic awareness becomes important. Our program does not only focus on teaching children the alphabet and identifying letters. We focus on taking small sequential steps towards literacy such as modeling how to read from left to right, and understanding the important parts of a book. 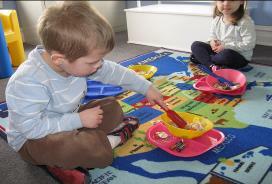 Our focus in our preschool programs is more focused on learning the sounds that letters make. Teaching children sounds that are associated to the letter will build a better knowledge base for future reading skills. Math and Science are a part of all of our classrooms every day. Children are encourage to explore independently as well as be guided through many experiences that will challenge their thinking and encourage children to become explorers and problem solvers. Field trips are loved by all. We try to plan field experiences for all of our classed. Our Preschool groups have monthly field trips in the summer and We usually plan a Fall Harvest trip for a Hay ride or trip through a field or pumpkin patch. In the spring we like to visit DeSales University for their children's plays. There is always plenty happening. 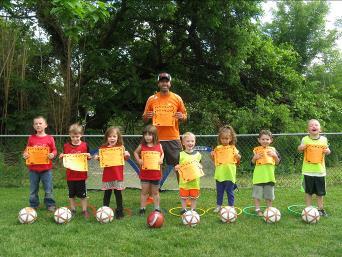 Each year we offer parents the opportunity to enroll their child in “Bass Soccer Shots” which is local soccer program, that runs programs at our facility. Coach Bass is a member of the National Soccer Coaches of America. His passion is to be a positive role model for children and understands how a child's confidence and attitude is affected by their coaches. In addition This year soccer shots has gone global and has pledged $1.00 for each child registered to disadvantaged youth. Included in our program we spend an entire month exploring the meaning of community. To further this exploration we invite many community members to our school in order to share with us their roles that they play in the area and how important and diverse all of these roles are in providing for the needs of the town. 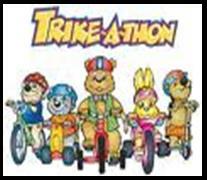 Each year as part of our community awareness theme we hold a Trike-a-thon to benefit St. Jude Research Hospital. 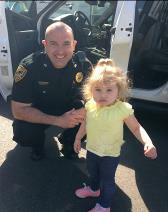 In addition to learning about the people in our community and raising money for sick children we also incorporate bicycle safety into our educational experience. 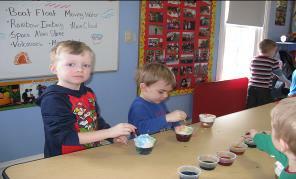 Our enrichment program focuses on specially designing each child's instruction to meet their individual needs . Our program provides additional instruction when necessary if a child is struggling. It also provides additional enrichment for those that may have already mastered many of the skills that their peers are working. 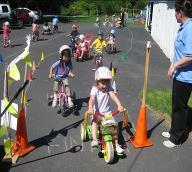 Our instructors will recognize when a child is ready to move on to the next step. 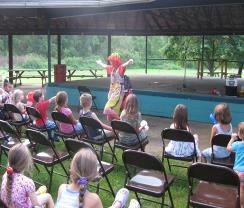 Every Summer our Facility hosts a summer picnic at the Silver Creek Picnic Grove in Springtown. 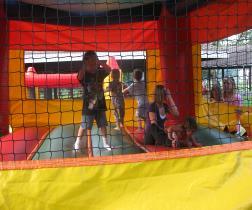 There are amusements such as a moon bounce and a playground. There is an amphitheatre where we have entertainment for the children as well as music. Most of our families bring a pot-luck dish while we provide the main course of hamburgers hotdogs and barbecue. At the end of the pre-k school year in June we hold a graduation program in which the graduating class performs and receives awards commemorating all that they have learned. 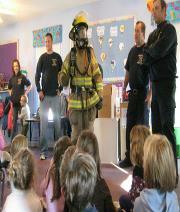 The program usually includes a video presentation and the children perform followed by celebratory cake and refreshments. Every year our center hosts a Christmas program that involves all of our classes in performing for their parents. This is an event filled with excitement, as all of the children are able to showcase their talent on stage. Our program is generally preceded by a video presentation that allows parents to view many of the special moments that have taken place throughout the school year. Included in our Preschool program is the opportunity to be included in specially designed social skills groups that are offered weekly. They are led by a board certified behavior specialist.